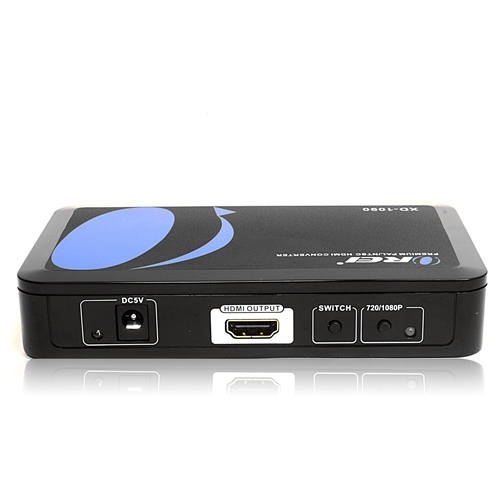 The OREI XD-990 is an advanced Composite A/V or HDMI to HDMI Scaler. It accepts HDMI input or composite A/V and upscales it to a HDMI output (at a number of selectable resolutions) with selectable output of PAL (50hz) or NTSC (60hz) and additional coxial digital audio or 3.5mm audio out. Any HDMI input resolution could be up-converted up to 1080p or down-converted as well to any resolution (720p or 1080p). 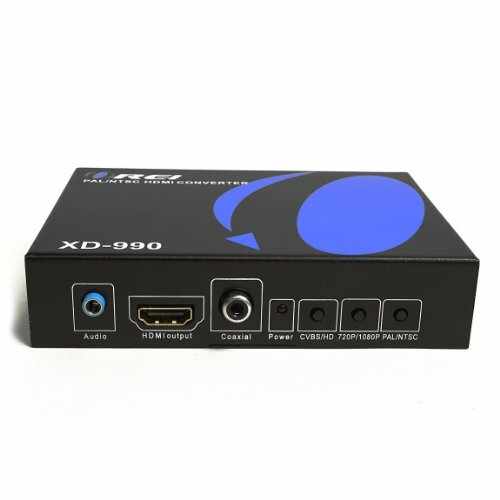 The XD-990 is also a perfect solution for converting HD signal from 50Hz to 60Hz or 60Hz to 50Hz, this feature will allow you to connect HDMI video source from a PAL format region to a NTSC region, for example, a European HD source to a USA TV with HDMI input. LCD or PLASMA TV: Use an NTSC (American) TV in an overseas PAL country, convert PAL HDTV signal to NTSC HDTV to make it compatible with your American TV. Local PAL HDTV tuner like a Cable Box or Satellite Receiver is required. This converter does not tune channels. 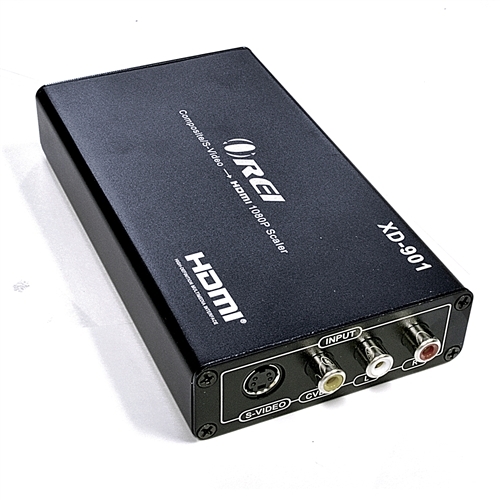 The OREI 1090 is a premium Composite A/V, S-Video, or HDMI to HDMI Scaler. It accepts HDMI input or composite A/V and upscales it to a HDMI output (at a number of selectable resolutions) with selectable output of PAL (50hz) or NTSC (60hz) and additional coxial digital audio or 3.5mm audio out. Any HDMI input resolution could be up-converted up to 1080p or down-converted as well to any resolution (720p or 1080p). The XD-1090 is also a perfect solution for converting HD signal from 50Hz to 60Hz or 60Hz to 50Hz, this feature will allow you to connect HDMI video source from a PAL format region to a NTSC region, for example, a European HD source to a USA TV with HDMI input. With REIO Technology which provides it optimizes the whole process and resulting in a more precise, more vivid and no jitter image. Works perfectly even for fast moving video and action scenes. The OREI XD-2000 is an advanced Composite A/V or HDMI to HDMI Scaler. It accepts HDMI input or composite A/V and upscales it to a HDMI output (at a number of selectable resolutions) with selectable output of PAL(50hz) or NTSC(60hz) and additional coxial digital audio or 3.5mm audio out. Any HDMI input resolution could be up-converted up to 1080p or down-converted as well to any resolution (720p or 1080p). The XD-2000 is also a perfect solution for converting HD signal from 50Hz to 60Hz or 60Hz to 50Hz, this feature will allow you to connect HDMI video source from a PAL format region to a NTSC region, for example, a European HD source to a USA TV with HDMI input. OREI XD-901 Digital Video Converter delivers high-quality converted pictures, exceptional super-stable synchronism and superior color separation. It is ideal for cable box, satellite receiver, tape conversion, DVD players, digital camcorders, video editing & capture, multisystem VCR and multimedia applications. 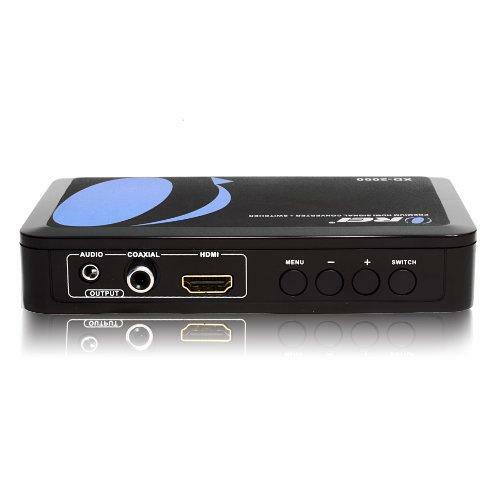 It accepts S-Video or Composite A/V connection from PAL or NTSC source and upscales and converts it to HDMI (50/60hz) signal. TVs: Take your NTSC American HD TV overseas or bring your PAL or SECAM TV to the USA . Using the high conversion quality of the OREI XD-901 to convert TV signals from PAL to NTSC or vice versa. Eliminating the need to buy a new multi-system TV set. Since this converter has a digital video processing, you will have a very low signal degradation, almost impossible to see the difference. PAL Camcorder: Connect any analog source with A/V or S-Video connection to NTSC HD TV.